THE RAMEN RATER> Can you tell me a little about how Miso Soup Design came to be? MISO SOUP DESIGN> Founded by Daisuke Nagatomo and Minnie Jan, MisoSoupDesign is an architectural design studio that concentrates on the process of making. After graduating from Columbia University GSAPP (Graduate School of Architecture Planning and Preservation) and worked in New York for many years, they decided to achieve the dream of making a project come true, by joining Solar Decathlon Europe 2010, and dedicate in the research of sustainability. After that, they began to apply the systematic way of thinking in both architecture and product design, and discover the surprising moment when form meets function. Currently, MisoSoupDesign has offices in Tokyo and Taiwan, and they are both Assistant Professor at the National Chiao Tung University. Received awards include A’Design Award Golden award, 7th Far Eastern International Digital Architectural Design Award, and ACADIA architectural competition 1st prize. TRR> How did you get the idea to transcend your architecture design skills to the ramen noodle bowl? MSD> When designing a building, we want to achieve both esthetic and efficiency. We believe it is the same for product design, so form and function can be combined. TRR> How did testing the bowl go? MSD> To achieve the slick shape of the bowl, we have done many tests with ceramic. It challenges both the designer and the maker how to perfect the curvature, and we have finally came to the ideal form. TRR> What material is the bowl made of? How did you decide what material to use? MSD> Traditional noodle (bowls) are mostly made with ceramics. Noodles can be extremely hot, so we chose double layer ceramic skin to prevent people from getting burned. It also keeps the soup warm longer. 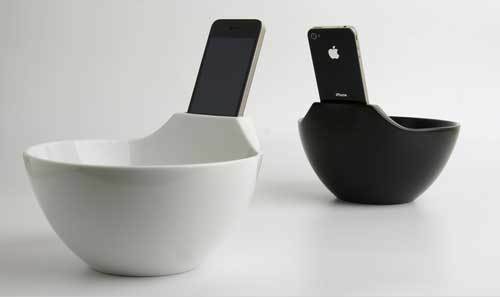 TRR> Will the bowl hold only the iPhone? MSD> It holds iPhone and all similar size devices. TRR> What colors are available? TRR> Where can people go to purchase one? MSD> Our latest model is being made at the moment and it will go to the US in a couple of months. TRR> Are there other products that you’ve designed? 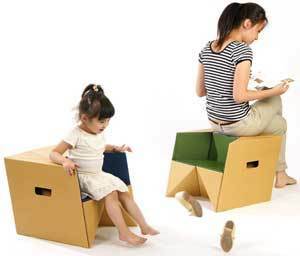 S-CUBE has inherited the cardboard box shape and material to create multifunction: stool, seating and steps. The sheet of cardboard is precisely cut by CNC machine and folded to create polygon blocks, and turn S-CUBE into a strong yet light-weight structure. To upgrade the cardboard box, we have added different color leather at the child’s seating area. At this moment, the cardboard box still keeps its original material and form, but the function has completely changed. The flashlight on iPhone has been given a new task. 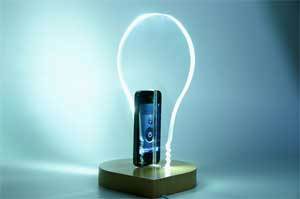 While charging, the phone is placed strategically in between the slot of the acrylic, which acts as the lamp itself. With a nice wooden base and just one piece of acrylic on top, this phone charger can turn into a charming night light. Taken from the hexagon shape of a snow flake, the units let user to create their own wall. 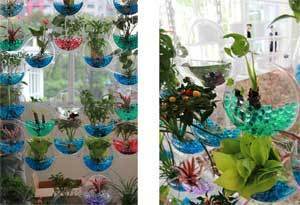 The units can be combined for planting purpose and turn into vertical farming. Even if the resident does not own a roof garden, one can still grow plants with the little space next to the window. It is also a useful container for everyday items. With a little more imagination, the bracelet is an abstraction of MoNTUE museum’s logo with triangular tessellation with Delaunay algorithm. We have applied mathematical terms and turn each corner into a point, which then creates triangles. 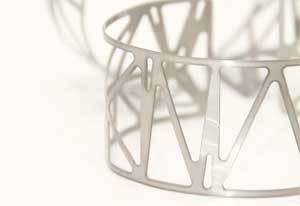 The geometry is precisely cut by CNC and bent into a bracelet. MoNTUE can be mysteriously coded. If we add the length of each letter in the same direction, it becomes a bar that reflects the original text. It may appear to be simple straight bars, but they are actually special surprising text. TRR> Thank you for this opportunity to find out more about the Anti-Loneliness Ramen Bowl and Miso Soup Design! There you go! Keep your eyes peeled for an in-depth review of the bowl itself soon! This entry was posted in * News / Noodle News and tagged anti, anti loneliness, asian instant noodle soup, buckwheat, ceramic, cooking, dock, fried noodle, hans lienesch, instant noodles, instant ramen noodles, iphone, ipod, itouch, korean noodles, lienesch, loneliness, lonliness, mi goreng, noodle, noodle bowl, Ramen, ramen blog, ramen bowl, ramen rater, ramen recipe, ramen review, ramen reviewer, ramen reviewers, ramen reviews, ramen video, ramenrater, ramenrater.com, ramyeon, ramyun, rater, rating, ratings, review, reviews, seattle, spicy, taiwan, the ramen rater, theramenrater, theramenrater.com, top, washington, wheat noodle, yakisoba on February 19, 2013 by Hans "The Ramen Rater" Lienesch.